The ENGINITE pilot of the Training Programme is already half way through and it’s running in parallel in Cyprus and Greece. 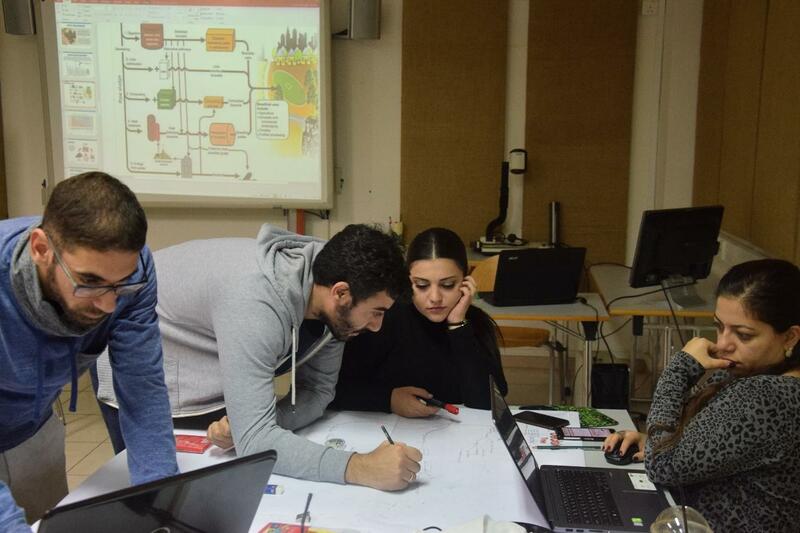 Approximately, 40 engineers in Cyprus and Greece are having a unique experience participating in ENGINITE to accelerate their practical hands-on experiences, improve their technical skill and increase their employability. Problem based learning (PBL) was successfully implemented by all trainers, as the PBL pedagogy was in the core of the eight ENGINITE courses. In all ENIGNITE courses, the participating young engineers were asked to work collaboratively in teams as well as to propose doable and efficient solutions on complex, realistic problems. At the end of each course, the teams presented their solutions. Constructive dialog and valuable feedback were provided by trainers and peers. With no doubt, the ENGINITE PBL courses promoted 21st century skills (collaborative construction of knowledge, critical thinking, problem-solving, and self-regulation skills) together with knowledge in the domain. In Cyprus the overall training was delivered by Dr Stelios Yiatros, Dr Ioannis Vyrides, Dr Orestis Marangos, Elpida Georgiou, Charis Samanides and Maria Andronikou from the Cyprus University of Technology, Panos Andreou and Andreas Andreou from CUBEIE L.L.C., and Christina Achilleos from GrantXpert. In Greece the overall training was delivered by Dr Kostas Komnitsas and Dr Nikolaos Xekoukoulotakis from the Technical University of Crete. Additional experts from the industry or the academia were invited to present. Special thanks to Mr Andreas Dionisiou – Engineer for Energy issues at Cyprus University of Technology, Mrs Katerina Tsagkari – Group Public and Regulatory Affairs Manager at Coca Cola and Mrs Maria Kyriakou – Research Partner at Sewerage of Limassol-Amathous, and Dr Despo Ktoridou, Academic in Engineering from the University of Nicosia. Dr Andri Ioannou (Project Coordinator), Dr Yiannis Georgiou (Project Manager) and Mrs Nicoletta Pantela (Research Associate) overviewed the successful implementation of PBL and the evaluation of Phase 1. Oliver Broadbent from ThinkUP and Søren Willert from Aalborg University were supportive of the overall PBL effort, all along the way. The ENGINITE team supported the young engineers in any way possible to help them enrich their knowledge and skills in all eight domains of the coursework. Together, we have made this a successful experience for your Young Engineers! Some Testimonials from our Young Engineers! The consortium is happy to announce that well-known local and multinational companies have already offering internships to the participating engineers in Phase 2 of the programme. In both Cyprus and Greece, the ENGINITE Programme Phase 2 (Structured internship via the placement of the graduate engineers in Industrial Partners/Companies) has already commenced as of January 21st, 2019. We would like to thank all collaborating companies for their support to us and to the new generation of young engineers!